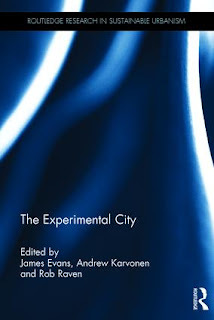 This new book called The Experimental City, which features many GUST researchers, explores how the concept or urban experimentation is being used to reshape practices of knowledge production in urban debates about resilience, climate change governance, and socio-technical transitions. With contributions from leading scholars, and case studies from the Global North and South, from small to large scale cities, this book suggests that urban experiments offer novel modes of engagement, governance, and politics that both challenge and complement conventional strategies. The book is organized around three cross-cutting themes. Part I explores the logics of urban experimentation, different approaches, and how and why they are deployed. Part II considers how experiments are being staged within cities, by whom, and with what effects? Part III examines how entire cities or groups of cities are constructed as experiments.